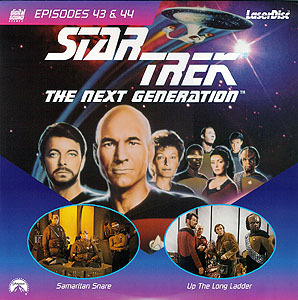 As Wesley (Wil Wheaton) prepares to fly to Scylla 515 for his Starfleet exams, he is joined by an unexpected traveling companion - Captain Jean-Luc Picard (Patrick Stewart). Unbeknownst to Wesley, Picard has been ordered by Dr. Pulaski (Diana Muldaur) to undergo a cardiac replacement operation. While Picard and Wesley travel to Scylla 515, the Enterprise receives a distress call. The Pakleds, a race of slow-witted humanoids, need help to repair their ship. Riker (Jonathan Frakes) beams Geordi (LeVar Burton) aboard the Pakled vessel. Suddenly, Geordi is disarmed and the Pakleds refuse to release him until Riker surrenders all of the Enterprise's computer information. As Riker struggles to devise a way to free Geordi, an emergency summons arrives from the Starbase: surgery complications have left Picard near death. Is the Enterprise about to lose both its engineer and captain? The Enterprise receives a distress signal from the Bringloidis, whose planet is being destroyed by stellar flares. Riker (Jonathan Frakes) decides to beam aboard the entire civilization - 200 humans and animals. Led by a friendly tipper named Danillo O'Dell (Barrie Ingham), the Bringloidis were separated from a second colony of humans who disappeared without a trace. Suspecting that the second colony might also be imperiled, Picard (Patrick Stewart) begins a search that leads him to the planet Mariposa. On Mariposa, an Away Team finds a colony of clones suffering from a degenerative condition called Replicative Fading. 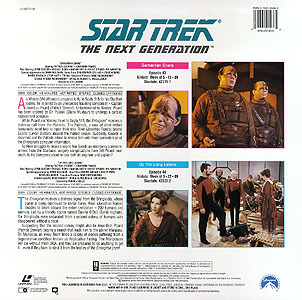 The Mariposans will die without fresh DNA, and they are prepared to do anything to get it...even if they have to steal it from the bodies of the Enterprise crew!